Midwest Environmental Services offers a wide range of waste disposal and cleaning services, especially for confined space situations. Using state of the art equipment, supported by our experience and technical resources, we can offer a solution to most every company’s industrial cleaning and residue disposal requirements. Midwest Environmental takes pride in providing responsive, professional services and is prepared to guide you to cost-effective environmental compliance. 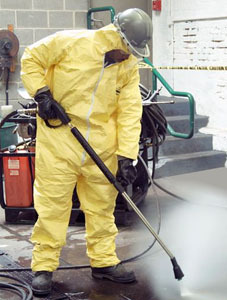 We have been assisting companies in their clean up efforts for decades. At Midwest Environmental Services, we are committed to providing the highest level of service, safety and convenience, all delivered by highly trained professionals. We always utilize the best equipment in the industry and operate specialized industrial cleaning equipment capable of meeting any need. If you are looking for a true partner to assist in cleaning your facility, take advantage of our experience. We’ll show you what a difference the right selection can make. Want more information on Midwest Environmental Services? Contact us online for more information, or call 800-388-5160.